Pruning hibiscus is great fun because it’s a GREAT plant! The hibiscus plant is strong, easy to grow, easy to shape is water efficient, and has awesome blossoms and beautiful deep green leaves. It also responds very positively to pruning – which makes it extra fun to prune! One of the reasons I love pruning hibiscus is because of the way it feels in my hands while I prune. The hibiscus stem is an interesting combination – it’s woody and soft at the same time. Woody from the outside and soft from within. And as a plant it can be used as a hedge, or as a solo shrub. And it can be pruned hard and deep without fear of causing damage, because every cut makes it stronger and healthier. Note – The deciduous hibiscus is a different story altogether. Before you prune – The hibiscus shrub prefers warm weather. 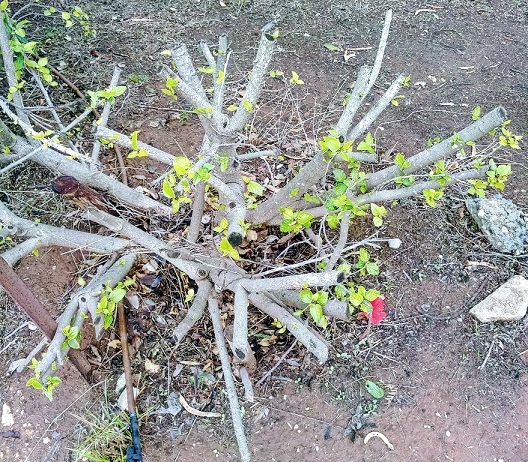 In winter it sheds most of its leaves so obviously, there are no excuses for pruning hibiscus in winter, except for removing dead or damaged branches. Avoid pruning your hibiscus when it’s too hot or too cold as well. Hibiscus is a hero and easy to handle, but still, it doesn’t really like extreme weather, so if that’s all the consideration it’s asking for…. I say, let it have it. Hibiscus responds really well to any and all pruning, especially if it takes place just before it starts to get a little warmer. If you prune soon after the buds begin to come out you will have caught the moment and will be rewarded with a whole bunch of large new flowers. You will have earnt a blossoming summer - and that my friends, is what it’s all about! Prune & play - when pruning hibiscus there is no need to prune all the branches all at once. You can definitely prune only half the bush, and leave the other half for later in the season, or even next season. Prune and play, means you get to decide what you want to achieve from your hibiscus. More flowers? stronger branches in the future? Maybe both? There are no rules - just make the cut and see what happens. That's why sometimes, I like to HALF prune. It lets me keep track of how the plant responds without "losing" the original ‘direction’. There are no guarantees, no 100%, I can only tell you to keep trying, testing, cutting and waiting - trial and error, over and over again… until you feel confident with your hand pruning skills. There are lots of "rules" and precise instructions – but the most important one I can give you is to follow the basics and follow your gut. Where? As is the case in almost every other shrub, just above the node or bud. Cut at an angle, and leave just a small piece of stem above the cut. 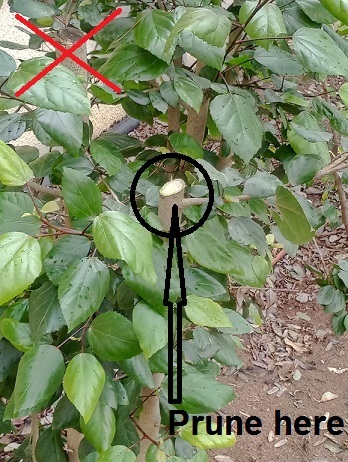 What you see in the picture is graded (by yours truly) as wrong (that’s why they got an X ) - because this specific stem was pruned too high above the bud, and if you have a good look you might recognize that the stem is rotting. On the other hand, it’s a hibiscus – you kind of can’t go wrong! With one hand hold the branches you don't want to prune, and with the other hand hold your pruning shears and CUT whatever your gut tells you to. 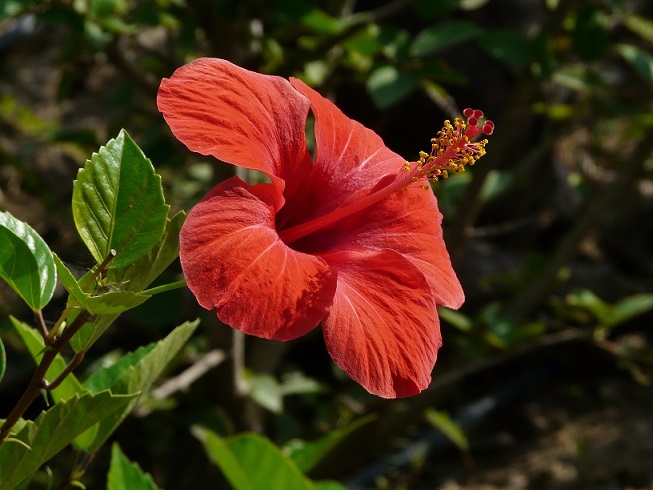 See why the hibiscus is such a strong resilient plant? I allowed myself to abuse my hibiscus - for teaching purposes only - of course!! And honestly, I only did it because I know a hibiscus would not only survive but recover bigger and better. Pruning a hibiscus as hard as I did, less than two thirds of the plants height, in early winter, and without a single cut being made in the right place, was frankly, irresponsible. But, you will soon see how amazingly it recovers!